Nestled on the beach, this Meedhupparu hotel is 0.1 mi (0.2 km) from Meedhoo Harbor. 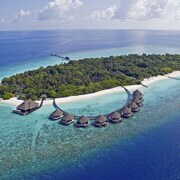 Situated in Meedhupparu, this resort is 0.1 mi (0.2 km) from Meedhoo Harbor. Nestled on the beach, this hotel is in Furaveri, within the vicinity of Maduvvari Harbor and Meedhoo Harbor. 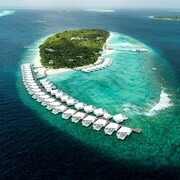 Situated in Huruvalhi, this luxury resort is in the same area as Meedhoo Harbor. Regional attractions also include Gemendhoo and Maduvvari Harbor. Nestled on the beach, this Finolhas Island resort is within 6 mi (10 km) of Kihaadhuffaru Island Beach, Hanifaru Bay and Dharavandhoo Mosque. 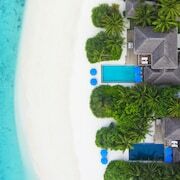 Nestled on the beach, this Fonimagoodhoo resort is within 9 mi (15 km) of Kihaadhuffaru Island Beach, Hanifaru Bay and Dharavandhoo Mosque. 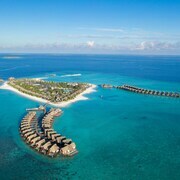 Situated in Aarah, this all-inclusive resort is close to Meedhoo Harbor. Area attractions also include Maduvvari Harbor. 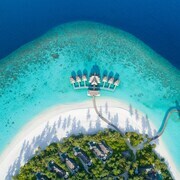 Beautifully appointed water villas, excellent service and great choice of food. Couples looking to get away will find a romantic atmosphere in Meedhupparu, and many visitors are sure to appreciate the restaurants and sea. The relaxing and welcoming setting also entices those visiting the city.